This is a spacious two storey, south facing house which is the private wing of the main house. It has its own separate access and private parking. There is a large fenced patio accessed from the house which has lovely views of the beach, the sea and some of Clew Bay's islands. The luxury accommodation is well finished with antique furnishings and paintings by local artists. It is set in secluded mature woodland with access to the clean, tidal seashore through the private woodland garden. Large central entrance hall with ramped entrance from outside paved area. French doors opening into the sitting room and the kitchen. 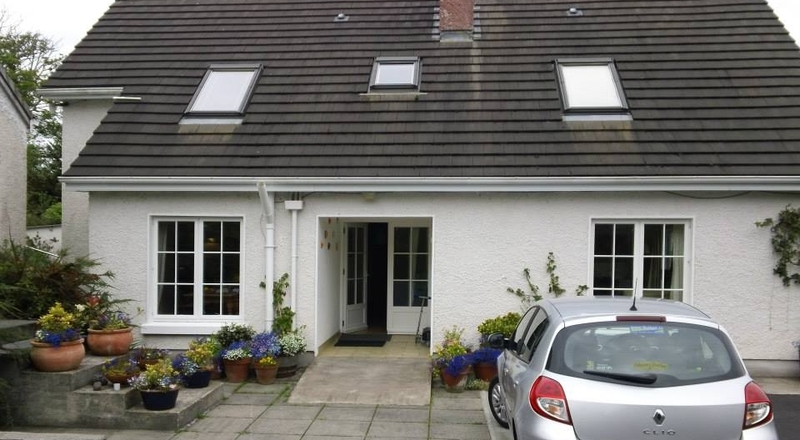 Spacious, light south facing sitting room opening through French doors onto paved patio area. Fully equipped kitchen with dining area. Dishwasher, Washing machine and Dryer. Spacious south facing bedroom with seating area and french doors opening onto a balcony, the view from which is seen above. Super king sized double bed and a single bed. Ensuite bathroom with large shower and bath. Large bedroom with king sized double bed and a single bed. Ensuite bathroom with large shower. Third south facing double bedroom with spacious ensuite bathroom with large shower and bath.